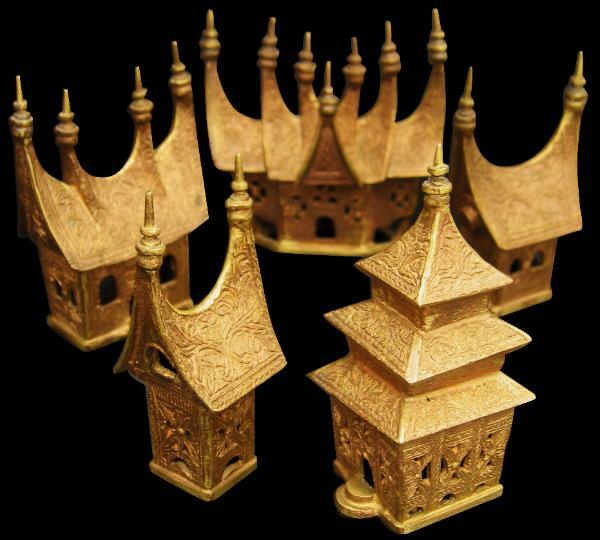 This model village of cast brass with remnants of red staining comprises 5 pieces: a village headman’s house (rumah besar), a mosque with a multi-tiered roof typical of the region (missigit), two smaller houses, and a rice barn rankiang). The roof of each piece has been cast with typically Minangkabau scrolling vegetal motifs. Each also reflects traditional Minangkabau architecture, with roofs that sports multiple spires, representational of buffalo horns; buffaloes being integral to Minangkabau agriculture and commerce. The Minangkabau are a Muslim people who inhabit West Sumatra. Unusually, they are matrilineal – inheritance is through the oldest daughter and they are matrilocal – sons-in-law reside with their wife in the wife’s parent’s home. Significant numbers of descendants of Mingankabau settlers also live in Malaysia’s Negri Sembilan state where they continue with their traditional culture and still speak Minangkabau dialect. A cast brass model of a Minangkabau house is in the National Museum of Singapore Collection (catalogue no.B0317) and is illustrated in Singh, B., Malay Brassware, National Museum of Singapore, 1985, p. 34. A silver and gold filigree version was presented to the Dutch royal couple in 1904 – this set is illustrated in Wassing-Visser, R., Royal Gifts from Indonesia: Historical Bonds with the House of Orange-Nassau (1600-1938), Waanders Publishers, 1995, p. 147.